Scanned @ £5 in the Birkenhead store :( Crazy price if you can get it! Heat, OP! A few years back the 400g fruit &amp; nut ones were scanning at 1P in Tesco. Posted on HUKD, I got 16 bars, again hidden on the top of the shelves. £64 of chocolate for 16P......bargain! Toblerone has become such a rip-off now. I love it but remember when we were cheated? Previously we could get a 170g for a £1 and then the manufactures put big valleys of nothing between each pyramid and its weight dropped to 150g from 170g. Now you telling us that an individual bar is 100g. Why are we being ripped off like this? Can't see those on their website? Poundland 180g Twin Peaks, milk, white and fruit &amp; nut gets my vote. Anyone bought this? Are we sure there are really three in the box, and not just two with a gap where the third should be? Thx. You just reminded me bought these at Xmas and they're in the freezer! That's it, I'm driving to Dundee barefoot. well if that's the case, then it's never affected me yet. I know this is probably a well known exploit, but i was actually told to do it the first time by an Amazon rep on a chat.. so if i ever find that my account is limited, i will point them to that chat transcript and ask them why i'[m being punished for following advise by their own employees. I know it's 'grim up north' but surely Sunderland has more than one Boots? Great price. Can you please tell us what store you found these in? Won't let me checkout as says they're no longer available! Gutted, thanks though. These had Christmas designs on the package. Marked down as Reduced to Clear, there were loads when I was there. I saw them in a small Tesco Express. Were £1.50 two days ago. 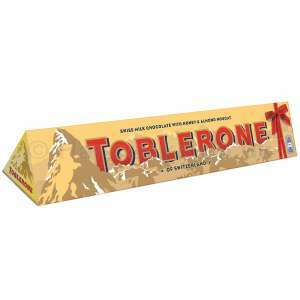 6 x 100g Toblerone bars only £2.50 in store - they had loads left when I was in. Loads of other sweets and chocolate on offer, too marked as Reduced to Clear. 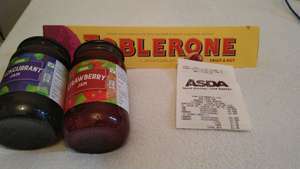 Got a large 700g Toblerone for £2.50 at ASDA a couple hours ago. Never miss a 'Toblerone' deal again! What's the use by date on those? 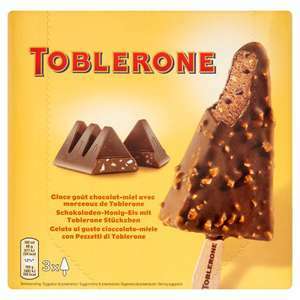 Toblerone Mixed Pieces Pouch 340g @ Tesco in store!! Wow... Bit of a deviation from the post. Thanks OP, wish me luck, hope there's some left. Will not buy this now they fund HMC who fund Al-quaeda as discussed in Parliament. 4.5kg Toblerone in-store at Tesco for £30. 66.6p for 100g. They had them today in the St Rollox store if it helps anyone. OK I'm interested - but it better be one hell of a snow storm! Oh for a white one. Already thinking I should stock up before I lose my supply. They get you hooked, then just cut you off! How could amyone eat all of this? Not keen on the new recipe either. Sorry but cold from me ..Minimum order is 2 and have you seen the delivery time :o :o ?? Just picked this up thanks! Personally I think I would buy these more as they’re only £1 for 180g and everywhere I’ve been has the white chocolate variant (something that is quite rare for normal Toblerone unless I get the 300g for £3 at Asda). I would drive to Dundee in my bare feet for this deal. I am a Toblerone lover and I think they are exactly the same texture, yes twin peaks are quiet hard but so are Toblerone! Already in Poundland Peterborough Bretton on 13th Dec 2018 8) ? Gross for me, heaven for my other half. Don't believe they got sued (more they came to an agreement.) but Poundland had to change the design. It's cheaper at Morrisons, currently £2 a bag at my local store in the centre of Birmingham. A bird? Like a turkey? Expired as there is a post for "Tolberone". No white chocolate or peaks this year? Thanks , if s/he could spell! I did not see it, and my search did not show it. Let me tell that poster to edit the title as others will not be able to find it since HUKD does not do fuzzy search. What a great missed opportunity for many as others desperate for some Toblerone will not find that offer in a million years using search. Thanks, if poster could spell Tolberone correctly as Toblerone , then my search would have revealed it. That post does not mention the 2 for £6 offer (which is stated on the "Offer display Card" in smaller print.